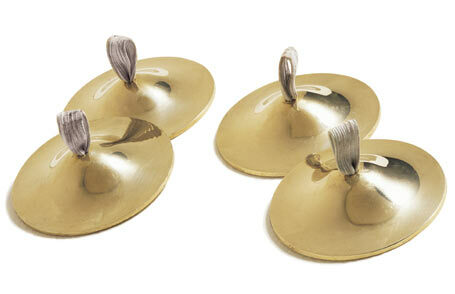 If you are new to Belly Dancing, you really need Finger Cymbals, also known as zills. Some of the best student zills are like these specially made for beginners to practice with. They are made of thick brass, approx 2" diameter, with a flat rim, not too big, and not too small with 2 holes. They come with pieces of 1/4" elastic and tiny gold safety pins so you can adjust the size to fit your fingers. This is a set of 4 zills, one is placed on the middle finger and one on the thumb of each hand.